For months - you've heard me, other party leadership and the candidates plead with you to get involved and do more to help ensure that we elect like-minded Democrats to office this fall. Fall is officially here. This is truly IT! Election day is Tuesday, Nov. 6, but actually a majority of individuals vote by mail, and those ballots go out on Wednesday, Oct. 10. So if you haven't been able to canvass, call, write or talk to your neighbors, the time to do so is NOW!! Fortunately, we have fantastic candidates fighting to represent LD 17: Jennifer Pawlik for AZ House and Steve Weichert for AZ Senate. Regardless of a person's political persuasion, it is easy to point out how votes for Pawlik and Weichert are far better choices than their opponents on any number of issues, from education, healthcare, equal rights and protections, to responsible and transparent government, to supporting Arizona families. volunteer at the office - organizing packets, answering questions, and providing support to the district and campaigns. We thank the many individuals who have stepped up to help, some for the very first time. We have to keep that momentum, that involvement, and expand it if we want to be successful this election. Your help, even one day a week, will have an impact on us winning this election. We cannot afford to look back on Nov. 7 and think about what we could have done. The website you are looking at right now! You can also help us keep the office running and maintain the supplies of brochures and other information necessary for our district. You can donate online here and click on the "Donate" button. Speakers: Roberta Neil Miller, candidate for the Maricopa County Clerk of the Court; Heather Macre, candidate for the CAP Water Board; and our very own LD 17 Dem Candidates - Jennifer Pawlik for AZ House and Steve Weichert for AZ Senate. Meetings begins at 7 p.m. on the second Monday of each month at the Sun Lakes Country Club (25601 E. Sun Lakes Blvd. N.), Navajo Room. Next meeting is Oct. 8. Agenda: The meeting will be an informal get together to plan the final push for the 2018 elections. All voters are invited to attend. The Sun Lakes Democratic Club collects non-perishable food items for Matthew's Crossing Food Bank. Please bring your tax-deductible contributions to the Drop Off Area in the west parking lot from 6:30 p.m. to 7 p.m. Ask for a receipt. The club donated 55 pounds of food and $69 in cash for August. The totals for 2018, so far, are 766 pounds of food and $296 in cash. We appreciate all you do. 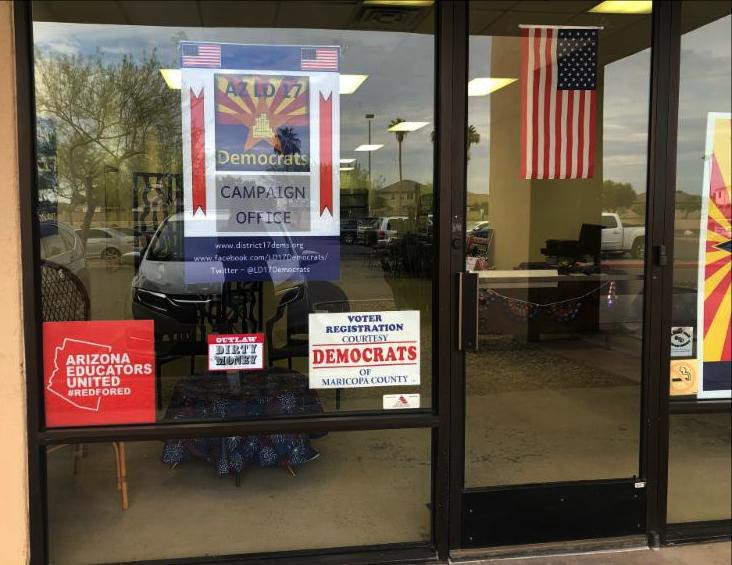 The canvasses begin at our office, 1450 W. Warner Road, Ste. 124, Gilbert. Democratic Candidate for Secretary of State and Senate Minority Leader Katie Hobbs will be speaking about the importance of the race on Sunday, Oct. 7, 4pm-5:30pm at the home of Rebecca and Doug King in Gilbert. Special guest is Former Gov. Martin O'Malley. Suggested donation is $50 but not required to attend. LD 17 Senate and House of Representatives Debate, held by the Arizona Clean Elections Commission - featuring Steve Weichert for Arizona Senate and Jennifer Pawlik for Arizona House of Representatives - Tuesday, Oct. 9, 6pm at the Chandler Downtown Public Library, 22 S Delaware St., Chandler. 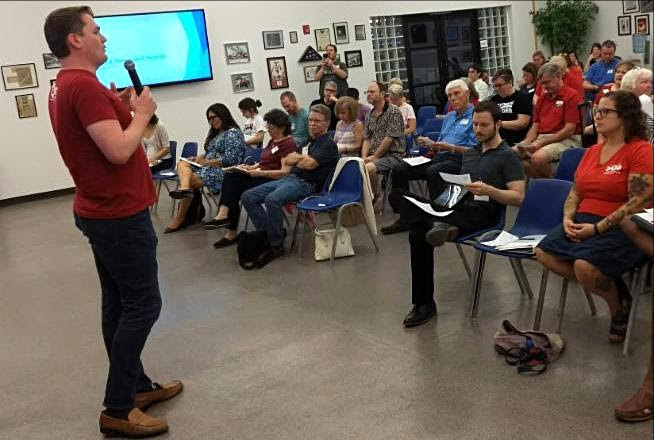 On Monday, Nov. 19, at 7pm, the LD 17 Democrats will have its Reorganization Meeting and Election. Any individual who is an elected PC for LD 17 is permitted to vote and run for any of the offices for the District (Chair, 1st Vice Chair, 2nd Vice Chair, Secretary, Treasurer, Sergeant at Arms, and Young Dem Representative). In addition, there will be approximately 25 State Committee Member positions available to represent LD 17 and you must be an elected PC to run. Please plan to attend and if you have questions, please contact Jacob. 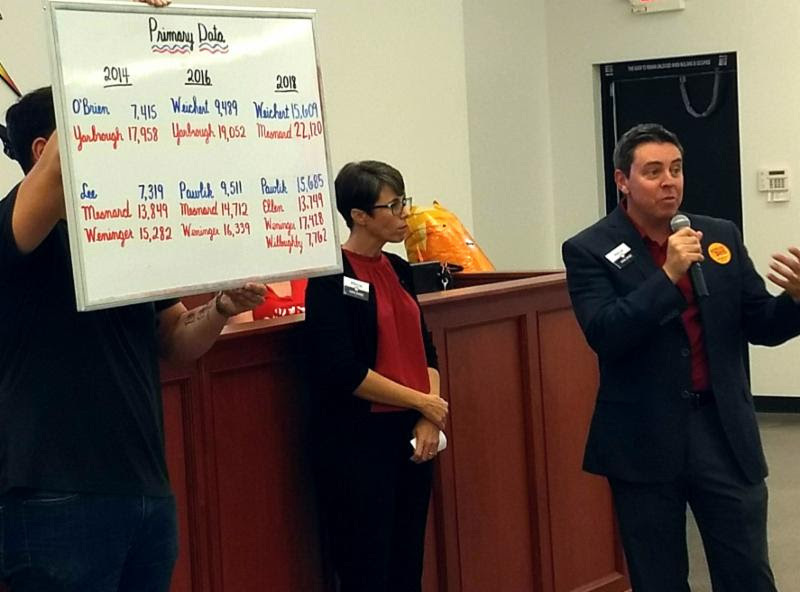 Results from recent primaries show how the number of voting Dems in LD17 continues to rise. Closing the gap is bad news for our opponents, good news for our candidates Steve and Jennifer. At our monthly meeting, Joel Edman from Arizona Advocacy Network reviews the propositions that will be on the ballot. Thank you to the many volunteers who joined us on a successful joint canvass with Planned Parenthood.